Find best campgrounds and RV Parks to explore the best of Tennessee: Appalachian Mountains, Mississippi River and the heritage of King Elvis…. Tennessee is located in the Southeastern United States. The state represents the “combined beauty” of the Appalachian Mountains and the Mississippi River. The largest cities of the state are Memphis and Nashville. If you go to Tennessee, you will love to visit American Museum of Science and Energy, Art Museum of the University of Memphis, Cheekwood Botanical Garden, Museum of Art and the Gray Fossil Museum. If you travel with kids, Dollywood is a place that you must visit. And of course there is the legendary Graceland (Memphis) that I guess it is a “must-to-see” regardless the age of visitors! Loretta Lynn's Ranch is a great family destination. It is located in the beautiful countryside, but not too far from Nashville. Most sites have grass, while thanks to the numerous trees there are plenty of shaded areas. There are 78 full hookup services with 50 amp connections (side-by-side hookups are also available). The park offers concerts, tours, museums, gift shops, pool, fishing, canoes, trail rides and more. People of all ages can enjoy this place. Pets are allowed for owners of campers and those renting cabins. May be the most important news - if you like concerts and country music, you will enjoy this place. Pine Mountain RV Park can be found close to the beautiful Smoky Mountains among rolling hills and lush forests. There are 61 full hookups here and 25 pull-through premium sites. There is a Pet Restriction on Breed and Size so please check the rules before taking your animal friend with you. Please note that you can only camp with an RV here, there are no tent sites! You can do all kinds of outdoor activities here such as fishing, rafting, horse riding, hiking, biking… (almost “you name it). Dollywood amusement park is in close proximity, so families with kids have busy days here! On the other side of the “spectrum” - Smoky Mountains with the Great Smoky Mountains National Park offer a lot of opportunities for a wonderful outdoors experience. Your choice! Clarksville's RV Park as its name may suggest is located close to the city. It has big-rig sites, pull-thrus with 20/30/50 Amps connections; and 35 sites with full hookup service. For tents there is a comfortably shaded area! On the premises you can use wireless high speed internet. Clean restrooms and showers are waiting for the guests; there is a laundry room too. The camp has LTD and RV supplies stores; you can also buy here LP gas, ice and firewood. The dump station will satisfy RV-ers. For kids the RV Park offers a playground as well as large pool and pavilion serving families. In close proximity you will find area with restaurants & shopping opportunities. And you will be here right next to the attractions in Campbell. Two Rivers Campground is located in a quiet, peaceful area. It is quite big with 104 places, including 78 with full hookups. The camp store offers a variety of groceries you may need on a daily basis, some typical RV supplies, but you can also buy there souvenirs and gifts to your friends and family. You can have some fun indoors in the game room playing pool, but there is also a swimming pool as well. Two Rivers Campground offers free internet, and guess what: free coffee! It is very close to Opry Mills, where you can do shopping. You can also take a shuttle bus to downtown Nashville and enjoy all that this town has to offer, including country music (for what Nashville is renowned). Some other attractions are Music City Vacation, Nashville Nightlife Dinner Theater, Corvette Museum and more……. 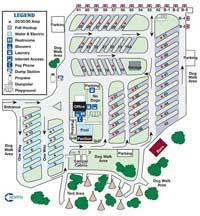 This is the largest RV resort in the Smokies areas. They have riverfront sites, all in a silent settings of nature. They offer shady RV sites with full hook-ups. Free Cable TV and wi-fi internet is provided. On the premises you will find fully stocked General Store with groceries and other items that you need for camping. Most of the outdoor activities here are water activities on the Little Pigeon River, which is right next to the campground. BTW - you can rent a boat from the campground for more meaningful “exploration” of the surrounding nature. If that is not your dream, or you have kids with you, then you will find fun and “security” in the waters of the park’s swimming pool. Take a tour of Nashville and stay at a campground nearby. The directory of campgrounds: tent and RV camping parks Tennessee (TN) may help you when looking for a great campground. People that travel with a pop up camper, motor home and other type’s of recreational vehicle campers love to camp in Tennessee. The area has so many places to stay and visit. If you are looking for a beach camp, look no father than Tennessee, the area campgrounds have many spectacular beach camps with available lot sites. Set up your mobile home and enjoy the adventures the area has to offer. With a motorhome trailer, you have many different options when looking for a campground. Look through a directory of campgrounds: tent and RV camping parks Tennessee (TN) to find a campground near an area of choice.